Bug Catcher returns for another battle against Pokemon Trainer! I rather like the overeager kid, and his excitement about his favorite Pokemon getting in the way of basic strategy was a very childlike aspect that was fun to cover in a comic. 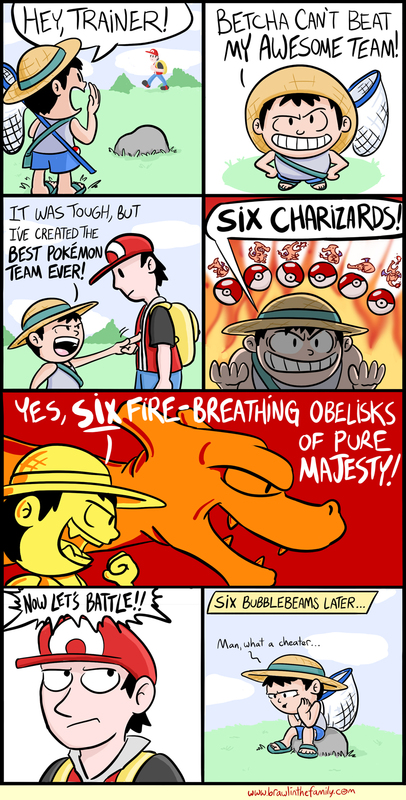 At the risk of inciting ire from Pokefans, I never was too impressed with Charizard. Despite his fairly immense popularity, he’s always been pretty generic to me–just your standard fire-breathing dragon. Not all that special compared with a massive plant-dinosaur hybrid, or a tank-like turtle with cannons on its back.